Australia's military consistently punches above its weight, and its approach to leadership is the key to its success. Developed over a century ago by fusing national values with battlefield imperatives, its approach has been fine-tuned over generations. It is now an adaptable and egalitarian leadership culture that ticks all the boxes for best practice. The military assumes no-one is born a natural leader, and that good training makes good leaders. Drawing on his own long military career and defence training programs, and on research, Nick Jans has identified the core principles of this consistently successful approach to leadership. These '3Rs' are the leadership skills which generate loyalty and commitment at an operational level, and they are just as successful in everyday team management as they are in the field. Leadership Secrets of the Australian Army includes real stories from the field and from workplaces, from everyday employees and from well-known leaders. It shows how you too can become a leader your team can believe in, and-equally importantly-how you can help them believe in themselves. Brigadier Nicholas Jans (Ret'd) OAM, PhD served in the Australian Regular Army in field artillery, training, and personnel policy development and was then a reservist for many years. Since his retirement from full-time service in 1985, he has consulted on leadership and strategic human resource management to the Australian Defence Force and the US Navy and US Army, as well as to many civilian organisations. He is a visiting fellow at the School of Business, UNSW, Canberra. 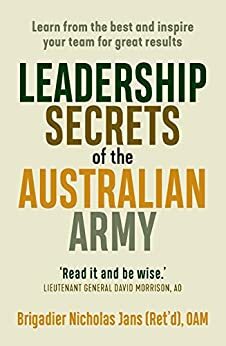 This book presents unprecedented aspects of Leadership that can be applied well beyond the realm of Defence. It is a book that all Leaders should have if they want to build an exemplary organization.